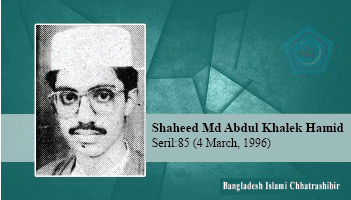 Abdul Khalek Hamid was a brave youth of Bangladesh Islami Chhatra Shibir. He was always busy with the organization. His dream address was Islami Chhatrashibir. Special achievements in education: Scholarship received from the Army Welfare Association. Other achievements: Theater actor / Laxmipur Sadar Police Station reporter. Awarded speech and patriotic songs at the cultural program on the occasion of Victory Day organized by Government Bangla College, Mirpur in 1995. 'I want in my heart to be martyred.' The words on night before martyrdom, 'I know I have to die, if death is through martyrdom, I will get the greatest pleasure.